When we were planning our recent adventure to Kentucky- each kid had their own requirement. The 10 year old wanted to see horses. The obvious choice for horses in Kentucky, was the Kentucky Horse Park in Lexington. When reviewing the area though, I really could not find any local caverns and the horse park was a good distance away from any of the cave systems we were interested in. 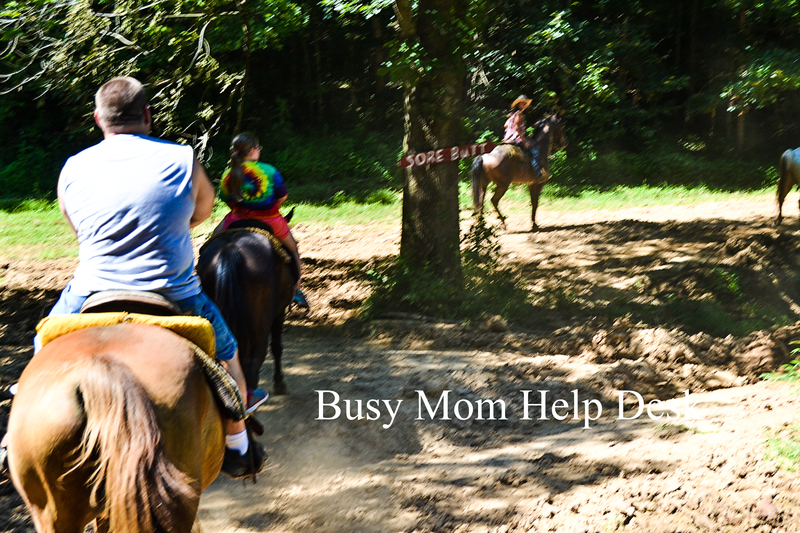 We were able to spend the morning in the caverns and the afternoon at the Jesse James Riding Stables. We did the one hour trail ride for $18 each. While my daughter had ridden ponies at the petting zoo and carnivals, this was the first “long” ride for her. I was really the only person in our party with riding experience. The staff did a great job of choosing horses for our group. The ride was really fun, with a little mud thrown in. There were uphill, and downhill spots in the trail as well, which was a lot better than a flat trail. If you’re looking for a fun day out, I highly recommend this riding stable. The Kentucky Action Park also has a lot of other activities. There’s an arcade, bumper cars and more. We were pretty worn out from our caverns tour and it was in the 90’s that day. So once we finished with our trail ride, we were ready for the hotel pool.